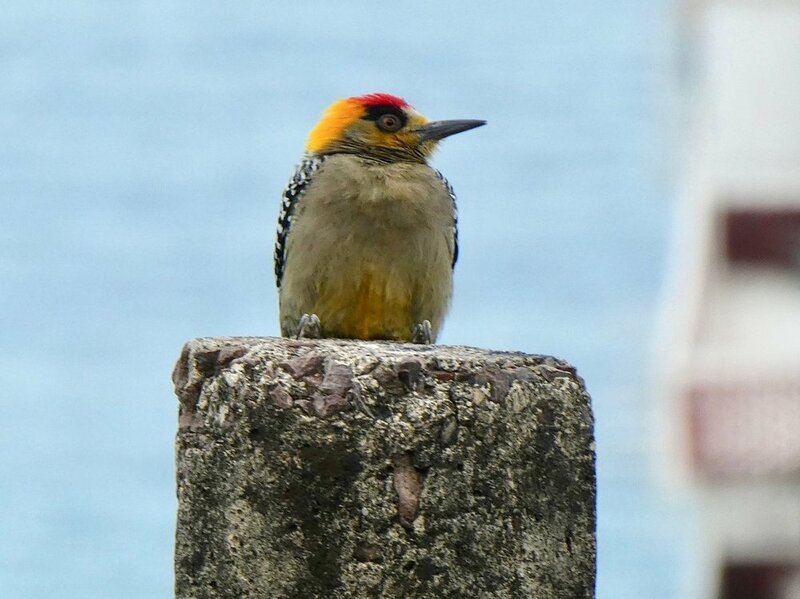 Is there a reason that the Golden Cheeked Woodpecker is in hiding on Whatbird? I can't find it. This pic was taken from our balcony in Puerto Vallarta, Mex. What do you mean? As in there's no profile page for it? It's a Mexican an endemic (one of my favourites from my trip! ), so that would be why. Is there a reason that the Golden Cheeked Woodpecker is in hiding on Whatbird? I've been a member of Whatbird for less than 24 hours so am trying to figure things out. As "Mexico" is one of the places listed in the search procedures I thought that the website covers it. Or are only Canada and the USA covered? We'll answer questions about birds found darn near anywhere but since most members are based in the US and Canada, those are the birds we're most familiar with. Fortunately, we do have a few members based south of the Rio Grande. @Aveschapines, can you confirm the photo? Confusing/inaccurate information removed at poster's request. Welcome to Whatbird, PV-John. As Egosnell2002 stated, the birds listed in the whatbird search database include birds of North America. Some Mexican birds appear in the database because they frequent the USA and Canada frequent enough to be part of the ABA checklist. If a bird doesn't make it to the ABA checklist, or similar checklist, it's probably not listed in the Whatbird database just like they're not listed in most North American Field Guides. Or something like that, more experienced birders may be able to explain that more accurately than I did. @Charlie Spencer I think PV-John was referring to Whatbird's ID search engine, https://identify.whatbird.com/mwg/_/0/attrs.aspx and not the forums specifically when he mentioned the absence of the Golden-cheeked Woodpecker. Ah! Sometimes I completely forget there's anything here outside the forums! @PV-John, if it hasn't already been deleted, please ignore my previous post! I've never seen a Golden-Cheeked Woodpecker, but consulting my Howell and Webb I'd agree with the ID. Oh, all this time I didn't realize that you were even requesting an ID... But as Aveschapines said, you got it right!